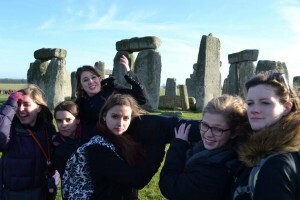 If I thought I was busy the first week in London, my goodness, was I mistaken! 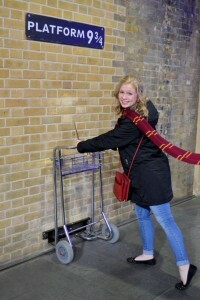 The last week and a half, the London Drama students and myself have seen three more shows, made a day trip to Stonehenge and Bath, and visited Platform 9 ¾! The city, while particularly gloomy this time of year, has been relatively splendid for all of my adventures thus far. 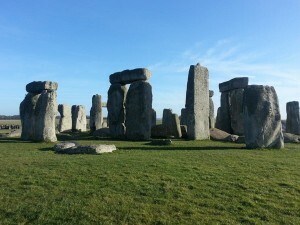 Stonehenge was magnificent! For a bunch of really old rocks, they held a beautiful prestige that was fascinating to learn about. Definitely a place worth visiting when traveling to the United Kingdom, if just to learn a little about the incredible history of the land. 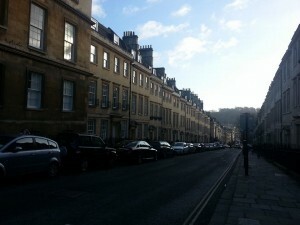 A place I also look forward to returning to is Bath! If I hadn’t known I was in England, I would have thought I was walking down the streets of an Italian city. The 18th century Georgian architecture was beautiful in its simple elegance. We made sure to make stops at the Royal Crescent, Circus, and Abbey of Bath, but waited to see the Roman Baths later when I return with my parents. While in Bath, I treated myself to a traditional English steak pie at the Georgian Teahouse with Elli and Emily, two women who are rapidly becoming my very close friends. Oh, and the tea! I now understand what all the fuss is about! I have gone from a two-cups-a-day coffee drinker to not being able to function without my habitual cup of English breakfast tea. Before I know it, I’ll be eating scones and clotted cream every day. Of course, coming from Wisconsin, I’ve always been a fan of fish fry, but it is true; the English know how to do bloody good fish and chips. Apart from London, I am happy to have finally booked most of my travels around Europe. I will be traveling to Scotland over Easter to visit my friend, Meghan, at St. Andrews, Denmark over spring break to visit a longtime family friend Karoline and her beautiful family, and in about ten days four friends and I will be making a quick jaunt up to Amsterdam! We’ve already booked our tickets to the Anne Frank House and the Van Gogh museum, two places I have always longed to see. And, if the weather is nice, we will hopefully be either renting bikes or traveling along the canals to see all the different sites. I can’t forget about classes… They have been amazingly insightful. By far, my favorite classes have been Shakespeare, Voice, and Stage Combat. My Shakespeare teacher, Zoey, casually dropped the bomb on us yesterday that her mentor was Woody Allen… WOODY ALLEN! And she’s a mentor at RADA, the Royal Academy for Dramatic Arts, just the premiere school that any actor worth his salt would kill to attend: no big deal. Since I’m on the topic of teachers, my audition tutor also has an impressive resume, having performed at the Globe and mentored Eddie Redmayne, the star of the new film, the Theory of Everything. LDA has really brought in the best of the best and I am so ecstatic to have the opportunity to learn everything I can from them during the next 12 weeks! …and we will be seeing The Bull tomorrow night!